We have added in two new services to our menu! The first is a beautiful signature facial for those looking for some extended relaxation, and the second is Microneedling with PRP! To find out more about these new treatment options read our newsletter below! CLICK HERE TO FIND OUT MORE AND READ OUR APRIL NEWSLETTER! 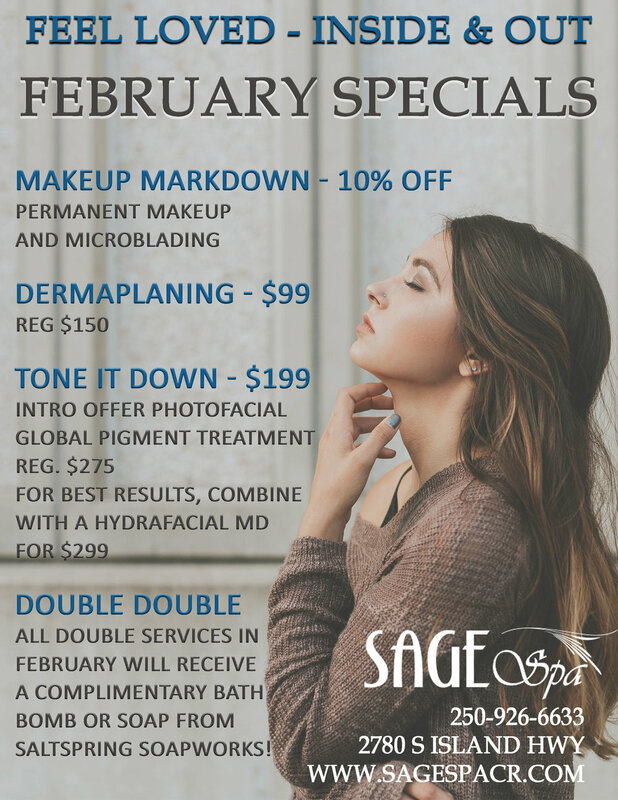 There are some amazing things happening at Sage Spa this month, including an awesome team addition and a very special Laser Genesis promotion. At the end of March, we are hosting our semi Annual AlumierMD Glow Chemical Peel Event - spots are limited and must be booked! CLICK HERE TO FIND OUT MORE AND READ OUR MARCH NEWSLETTER! With an extensive and always growing service list and retail selection, we are sure you can find a reason to fall in love with Sage Spa! Things are getting extra romantic as we head towards Valentine’s Day due to our Customer Appreciation event on February 14th. Join us during the day for our Glo Makeup Party! Enjoy special gifts with purchases, mimosas, and even complimentary makeup lessons! Don’t miss this event! CLICK HERE TO FIND OUT MORE AND READ OUR FEBRUARY NEWSLETTER! There’s a chill in the air as the season changes and that tell-tale bite reminds us it’s time to start planning for the holidays. It might feel premature, but there are only eight more weekends until Christmas. Within our newsletter you will find our monthly promotions, our latest team member, Alix Clarkson, and a new lip care product we are so PUMPED about! The season of letting go is upon us and we are falling in love with the changes all around it. As we are reminded of the importance of turning over a new leaf, we embrace the crisp weather and family time. Below are our promotions for October which focus on relaxation as we gear up for the most wonderful and busiest time of year. This month we also have an amazing AlumierMD Chemical Peel Event - details in our newsletter linked below! The kids are back in school and you finally get a moment to breathe. Take the time to check in with yourself and don’t forget to self care. Summer is always a whirlwind and it is easy to let your body and mind fall to the wayside, putting other people’s needs before your own. Our specials this month are designed to pamper you in the way you deserve. Also, take a look at our newsletter to find out more about our REWARD PROGRAM! This month it's all about honouring dad with something that he could really use. Take a look at our newsletter (link below!) for some ideas. We also have some amazing specials just for you! In addition to our promotions, you will also find some AMAZING news that will change the shape of Sage Spa by offering services we've never had before! This month is all about preparing for the summer with our monthly specials. 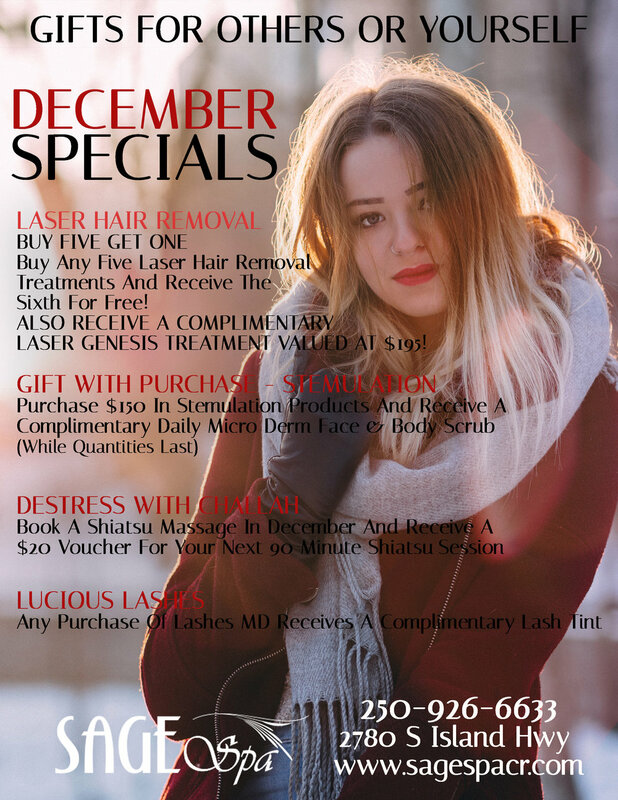 Read our newsletter to learn more about Laser Hair Removal and also how regular massages can benefit you! Sign on for self care this season with our latest promotion of the Self Care Combo. Read our newsletter for a more in-depth look inside Sage Spa, including our service and staff growth. Love is in the air and we are celebrating with some exciting February donations. In addition to amazing deals, read our newsletter to find out about new services we are offering and different ways we can help your Valentine's Day be better than ever before! With the success of our Holiday Open House, we are extending a very awesome promotion for Laser Hair Removal! We also have an amazing gift guide in our newsletter which you can read below! We hope you have a wonderful and safe Holiday Season! Mark your calendars for our Holiday Open House which is swiftly approaching. We also have some amazing promotions you won't want to miss out on this month and some really exciting news about Laser Services! Lots of exciting changes and promotions happening at the spa this month, including an amazing new service that combines the benefits of our two top services. 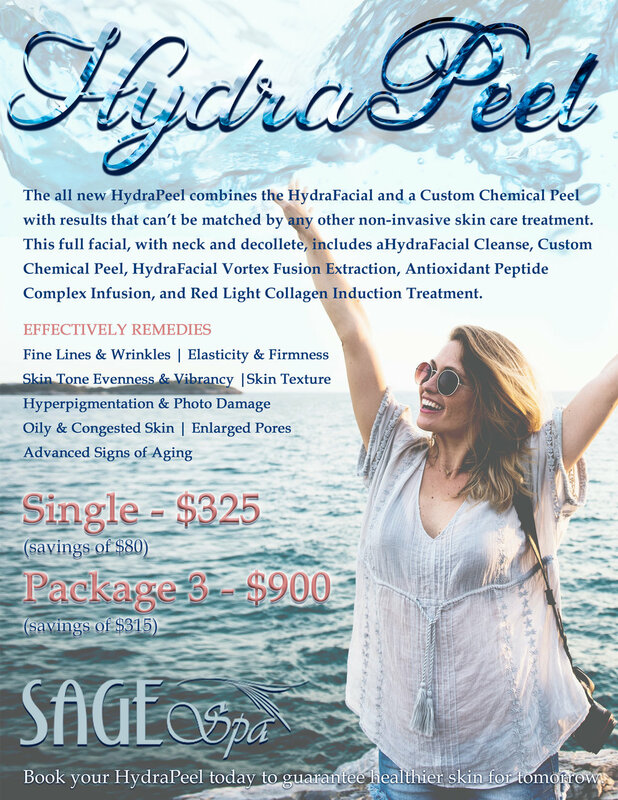 Read our newsletter to find out more about the HYDRAPEEL! Find out what's going on at the spa by reading our latest newsletter! Inside you will find tips and tricks for back to school, information about our HydraFacial VIP program, and our latest promotions! We are also hosting an amazing Glo Make-Up event. If you are interested in attending, please RSVP at the salon or through Facebook! We have some hot new promotions this month along with two product spotlights that highlight some must-have items for your summer arsenal. Click the link below to find out more about what's going on at Sage - including two new members of the team! Here's a quick rundown of our monthly promotions!